Ever wanted to start developing on Android? Google has just launched its online Android university - Android Training classes will guide through Android Developing 101 to the heights of app coding, so you really have no excuse not to try. The classes will educate you on best coding practices and include plenty of samples which you can use, but that’s just the beginning - Google promises to expand the program continuously. 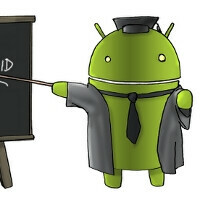 “We’re starting small and this is just the beginning for Android Training. Over the coming months we will be increasing the number of classes available, as well as introducing over-arching courses and sample apps to further help your development experience,” the Android Dev team said. Since the online courses address “common Android development problems” we have to specify which are those exactly - they range from optimizing battery life to having effective navigation. There are 11 sections with 34 lessons, so feel free to start exploring and coding now. Google, I respect you for Android (I may be looking to buy a Nokia in February or March but my heart screams "Pick ICS". Actually I am really interested in the course. I glad they did that, wouldn't want to remain the consumer the entire time. Good to get more people interested in Android development. Aw, soooo resisting the urge to TD just to be contrary. But, yeah a good idea is a good idea. I have a very good idea for an app , i downloaded the sdk tools , lol i was lost like a needle in a farm , i never had a programing experience before , actually i dont know anything about programing .